Luxury resort LUX Grand Gaube is located at Pointe Rejane which adjoins the small fishermen village of Grand Gaube in the north east of Mauritius. Erected on a secluded peninsula to ensure the privacy of its guests, the establishment blends a Feng Shui ambiance around beautiful gardens of Filaos, banyans and coconut trees. Travelers to the hotel are guaranteed a relaxing and leisurely tranquility. From the turquoise lagoon you can have a magnificent view of the five offshore islets - Gunner's Quoin (Coin de Mire), Ilot Gabriel, Round Island, Flat Island and Serpent Island. Click here to find the best deal, compare prices, and read travelers’ reviews about LUX Grand Gaube. The hotel has 198 rooms and suites, all facing the sea. Guests have a choice of 4 restaurants - The Kitchen, The Beach, Banyan - The Island Kitchen and the Abalone. The Kitchen is the main Restaurant. The Beach serves Mediterranean cuisine. Banyan - The Island Kitchen serves traditional Mauritian street food. The Abalone is located on the beach and offers light dishes for lunch and a selection of fresh seafood platters for dinner. The Bar serves light lunch or refreshing tropical cocktails while at dinner time you can enjoy a simple tasty menu with an extensive range of drinks. At Café LUX a blend of coffee from in house roasted coffee beans are available. - Check-in and check-out times: 14h00 on arrival day; vacated at 11h00 on departure. - All rooms are equipped with an individual air-conditioner and a safe. - Dress code: casual smart in the evening. - Entertainment by local artists or themed / DJ evenings. - Cinema, art gallery and hotel boutique. - Helipad and access to international golf courses. - Beach and pool services. - Water sports - both complimentary and applicable fees. Port Louis, the Capital: about 30 km / around 40 minutes by car. 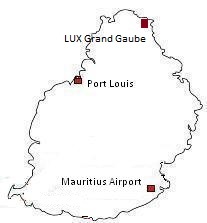 Mauritius Airport: about 80 km / around 75 minutes by car. Buzzing Grand Bay: about 12 km / around 20 minutes by car.